Spelling Bee: We watched the JK-2 spelling bee. Good work everyone! Arts night: We watched the JK-2 to performance. 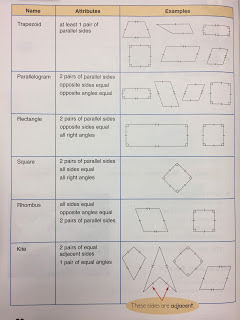 Math: Today we learned about the attributes of different quadrilaterals. We played a matching game to try and figure out what examples match the attributes. We even solved a few riddles. We loved the quick lesson today!